Qat is a popular shrub in Yemen, typically chewed to feel excited and euphoric. The stimulant plant is available in abundance in the war-torn country and drives an annual profit of $2 billion for qat traders. Also available in Yemen is coffee... really good coffee. In fact, the next time you order a mocha, think of Yemen, because that’s where the chocolatey-coffee drink got its name from. As early as the 1400s, Yemeni coffee beans first travelled to the rest of the world from al-Mokha Port. 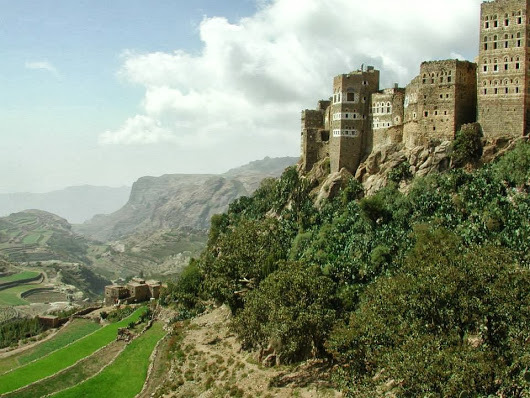 Unfortunately, coffee cultivation declined over the centuries as Yemeni farmers switched to growing qat. Today, however, many Yemeni farmers are realizing the distinct value of their country’s coffee, and with the encouragement of some religious leaders, they’ve begun to uproot qat trees and replace them with coffee trees. Sheikh Abdullah Abbas al-Musababi, one of the Haraz region leaders, said that Buhara Sultan, Muhammad Burhanuddin, a religious leader of the Ismaili sect, has encouraged farmers to cultivate coffee so they could export it abroad. Eastern Haraz has fertile soil, while 75% of its land is ideal for the cultivation of coffee, a product it is already famous for growing. Sheikh Musababi told The New Arab that the residents of Haraz have already “uprooted qat trees and replaced them with coffee trees in many areas east of Haraz." Getting rid of qat trees has another advantage: conserving water. "Our region suffers from a scarcity of groundwater," al-Musabibi said. "The cultivation of qat requires a lot of water, whereas the coffee tree needs a quarter of what qat needs." Yemeni farmers don’t have to do this alone. Financial assistance is available to them through a charity backed by the Buhara Sultan, so that they can uproot qat trees and plant other crops to earn a better living.